What Is Fractionated Palm Oil? What Kind of Sugar Is in Sugar Cane? What Happens When Sucrose Is Heated? If sucrose (C12H22O11) is heated quickly, it combusts completely. The carbon atoms react with oxygen to form carbon dioxide (CO2) and water (H2O). If sucrose is heated gradually in air, it goes through a complex process from melting to decomposition. Both processes require high heat which can potentially start a fire. 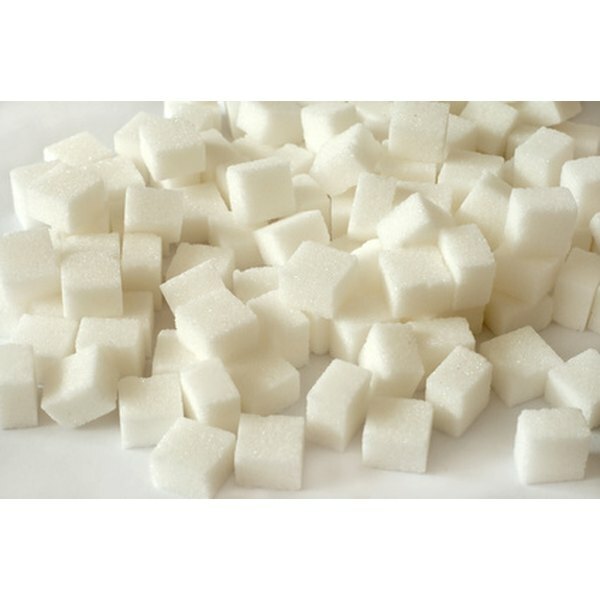 Initially, upon gradual heating, sucrose melts into a clear liquid and breaks down to form glucose (C6H12O6) and fructose (C6H12O6). As the temperature increases, the glucose and fructose molecules begin to lose water (dehydrate) and then the bonds between carbon atoms begin to break. The breaking of the carbon bonds in the molecule is partially oxidative and partially degradative. In the oxidation reaction, the glucose and fructose molecules formed upon the initial heating of sucrose react with each other to form caramelan (C12H18O9), caramelen (C36H50O25) and caramelin (average molecular formula C125H188O80). Degradation is the breakdown of a compound by stages, exhibiting well-defined intermediate products. The degradation products from heating sucrose include diacetyl(2,3-butanedione) and maltol and many esters, lactones and furans. Caramelization occurs during decomposition. The molecules formed dissolve into the melted sucrose and create a clear, light brown syrup. If heating continues, there will be further composition to a bitter tasting mixture. Continued heating well beyond caramelization will produce carbon contaminated with traces of decomposition products. What Is the Difference Between Plain Corn Syrup & High Fructose Corn Syrup?